Personally, I always feel a bit sad when beginning The Silver Chair because there are no Pevensies. I never fail to miss their presence in the story. This year the presence of Mr. Beaver was missed most vocally by Bookworm3 (age 2!) who remembers our read from last year and remembers who he is. She played with our Mr. Beaver but never heard his name in the story and wondered a bit about that. Due to the popularity of this series, I'm not going to launch into a description of what this book is about. (Here's a past synopsis for you if you have a need to know.) Instead I'll keep to sharing our experiences during this particular reading. This would be the kids' first time to hear this story and my third. (Or fourth?) As I say, this one always makes me feel a bit nostalgic for the Pevensies but my emotions are satisfied with Eustace who serves as my link to the past. As is the usual case, I can't read Narnia without crying out loud. I know the books well enough to brace myself, but the tears come no matter what. Honestly though, I don't mind. I'd rather cry as soon as not, no matter how confused this makes my children. (It adds to the memorable reading experience. Turkish Delight and mommy sobbing on the sideline. Ha.) In this book, my tears are usually the "fault" of Puddleglum who is, without a doubt, one of the most honorable characters in the entire series. He's a bit of what you might call a "fuddy duddy" but when pressed he is the first to stand up for what he believes is right. I love that. The most memorable chapter is when Puddleglum, Eustace, Jill and Prince Rillian are being woo-ed by the Queen of the Underworld. She is working hard to convince them that there is no such thing as Aslan or the sun either for that matter. She sways them with enchanted music, soothing words, and a magic smoke from her fire meant to get their guard down. Puddleglum is having a hard time holding to the truth as he smells the enchanted smoke and listens to her music, but he understands that the these are the very things that are causing the group of Narnians to drowsily cave in to the witch's arguments. He realizes that he needs to literally put a fire out with his feet in order that their heads would be cleared of the smoke and magic so that they can think for themselves again. Puddleglum is a character to be admired. He screws up the courage and does what needs to be done, even though he knows that standing for truth and doing what is right is going to hurt him. And it does hurt him because standing up for what is right usually has a hefty price tag attached to it. In this case, Puddleglum paid for truth with his foot. But the picture of his sacrifice had a deep impact on me. But four babies playing a game can make a play-world which licks your real world hollow. That's why I'm going to stand by the play world. I'm on Aslan's side even if there isn't any Aslan to lead it. I'm going to live as like a Narnian as I can, even if there isn't any Narnia. Even if I'm just playing a game and if, let's say, God does not exist, I'm still going to live as if He does. I am going believe in His existence until the last breath leaves my body. Because I think my "play world" licks the "real world" hollow. I feel very blessed and encouraged by reading this book again. It was good for me to read of Puddleglum and keep company with him a third or fourth time. I suspect a six, ninth or thirteenth time might be necessary. Bookworm1's favorite character was Aslan but his favorite scene was when the Queen of the Underworld turned into a snake and the others fought her to the death. You could have heard a pin drop in the room during the reading of that chapter. Bookworm2's favorite character was also Aslan but he laughed every single time Jill called someone a "pig." It's a hilarious insult. Especially when you are five. Bookworm3's favorite character was the Turkish Delight . It feels like I've had to wait forever and a day to enjoy Narnia with my own kids. Fewer books give me greater delight to share with them. I love it!!! I will be linking this post up to Amy's Read Aloud Thursday at the end of the month. Oh my. I LOVE this sort of review...filled with all the connections and associations from you and your children! Thank you for all the great ideas...love the Puddleglum quotes also!!! Such a neat post! Makes me wish I could share these books with someone from the first time. Or reread them. If only I weren't so far behind in my reading. I too love reading posts like this! It made me want to dive back into Narnia for myself. I can't wait until I can start reading to my daughter! Thanks so much for sharing all of your thoughts as you read through this book! 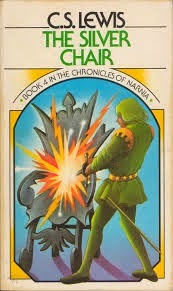 I think this summer I would like to READ (not listen to on CD) some Narnia with the kids. However, I do think some toys would be helpful. And Turkish Delight. Possibly a small investment in their literary futures. Sounds like a delightful experience all around! Love this post, love your ruminations, love the kiddos!